The money-smart way to get your group weaving. 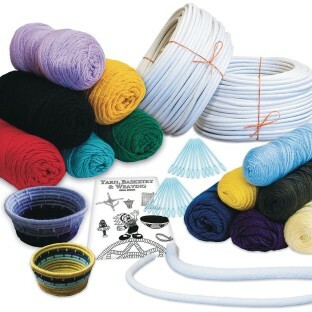 Includes all the materials you need. The product arrived in bulk and then had to be set up individually making hard for the first time. IF I had known this I would have ordered earlier to try it out. The materials were of good quality but took time to get the project set up. You need to set this project up and read all the directions before giving it to the kids. There is measuring and some guess work needed for this project. Once you've tried it yourself it will be easier to explain. I had 5 year olds through 11 year olds making the baskets. They really enjoyed it and were excited about it being an ongoing porject. I use this project in a psychiatric hospital. This is a failure free project that everyone can do. It helps the patients focus on a task without frustration. Some say it calms them down. They have made some beautiful baskets for their family members. I have a waiting list to get into these groups. This is a thrifty craft idea money-wise. However it requires a good deal of preparation if being done in a group. I would not recommend it for a teacher or counselor attempting this with younger children. They have limited success. Teens or Adults would be a better age group.